From the looks of the cover, one might think this second volume of fall tunes may be a little dude-centric. True, but the ladies are in full force as always. This marks Taylor Swift's first appearance on any playlist of mine - and once you listen to #4, you'll understand why I gave in. 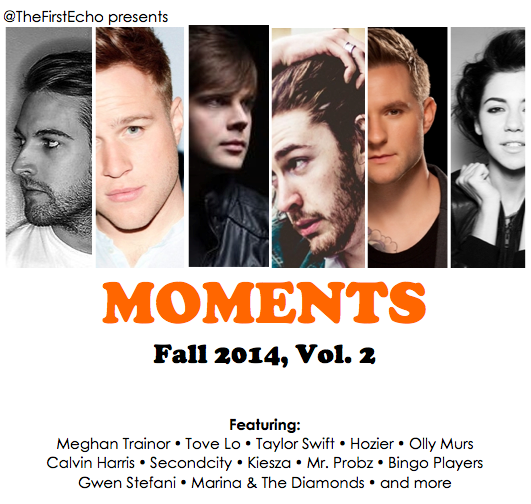 Then there's Tove Lo's "Moments," after which this compilation is named, because it. Is. Everything. (Seriously, her debut album, Queen of the Clouds, is one of the best of 2014.) But the real surprise may be Hozier's slot at #5, a track that will indeed take you to church and cause your jaw to drop when you hear this 24-year-old Irishman's voice.